This advertisement is for Dr. T. L. Nichols health care and advertises both journals and medical publications as well as some other products such as Nichols' Food of Health or his Sanitary Soap. There were many improvements in the treatment of illnesses during the Victorian era and there was a greater understanding of the spread of disease as well as a better knowledge of the body and anatomy. However visiting the Doctor was expensive for many at this time so many relied on home made remedies and medicines. 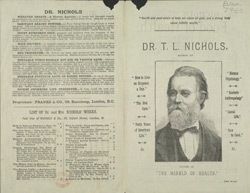 The medicines and food stuffs featured on this leaflet would have been seen as reliable and trustworthy because of the authoritative title of Doctor used by T. L. Nichols.